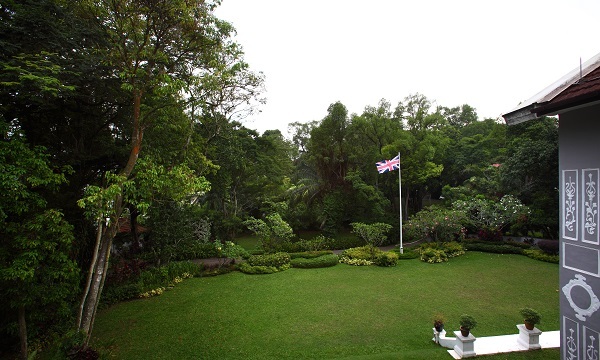 The second floor verandah of the British High Comissioner’s official residence, Eden Hall at 28 Nassim Road, commands a fine prospect of the front lawn, which is ringed by old trees, with the Union Jack fluttering in the wind. That view and the house itself is still protected, although the rest of the estate is up for grabs. This is because the UK government has carved up two plots (Plots A and B) on the eastern side of Eden Hall for sale by public tender. The sites have a combined land area of 34,254 sq ft, and amounts to 35% of the existing grounds of 97,889 sq ft. Plot A has a site area of 18,620 sq ft, and a 36 m frontage along Nassim Road. It includes a huge part of the garden along the driveway and an open air parking space for about six cars. The other land parcel, Plot B, has a long narrow driveway leading up to an elevated rectangular site adjacent to the house. Plot B has a total area of 15,634 sq ft. Both sites are zoned for residential use under the Good Class Bungalow (GCB) area of Nassim Road, the most prestigious address in Singapore. Given its wider frontage along Nassim Road, Plot A has a price tag of $2,200 psf, with the absolute price amounting to $40.96 million. Plot B is priced lower at $2,000 psf, owing to its long driveway, which translates to an absolute price of $31.27 million. CBRE is the sole marketing agent for both plots. The sale of Plots A and B will mean not just the loss of the eastern part of the garden but the swimming pool too. In return, the British High Commissioner will gain two new neighbours among Singapore’s seriously rich.